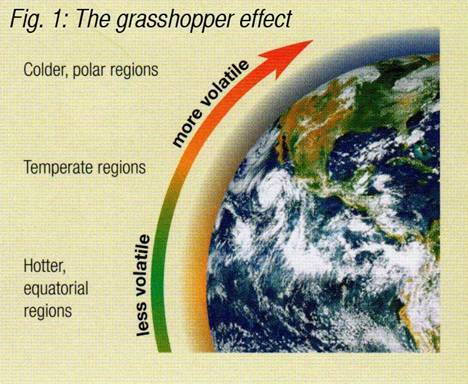 move from temperature to cold climates (Figure 1). and excreted, they can be as harmful as external toxins. Toxins play a major role in homotoxicology. In the original concept, Hans-Heinrich Reckeweg saw homotoxins as the basis of most diseases and that the inability of an organism to regulate in the face of their effects will lead to disease as we know it. This may sound simplistic, but eventually accumulation of homotoxins is the final outcome in genetic diseases, deficiency of nutrients, or even in psychological stressor. Although modern antihomotoxic medicine has evolved in treating consequences of dyregulation, such as immuno dyregulation for instance, detoxification is still one of the main pillars of treatment. The human body, being an open energetic system, will react in a certain fashion until the toxin is eliminated and balance is restored. The body will deal with these homotoxins in a very specific order, depending on the strength of both the homotoxin and the regulatory system. We can follow this process in the body very clearly by looking at Reckeweg’s map, the six-phase table of Homotoxicology, and figure 3. The body deals with toxins on three levels. Each will mount a defense against the homotoxin, and will leave fingerprints in the form of symptoms. By looking at these fingerprints we can follow the course of toxins through the body. 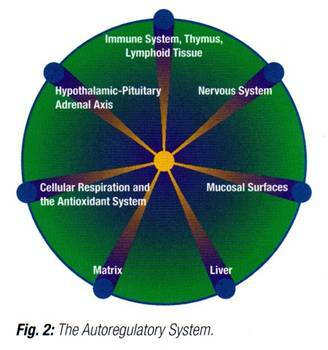 The autoregulatory system is our first line of defense (figure 2). If this is not successful in dealing with the toxin, the matrix or ground regulation system will be activated, as it is the barrier between the cell and the effector organs of the autoregulatory system. Only when the first two fail to eliminate the toxin will disease reach the cell (Figure 3).